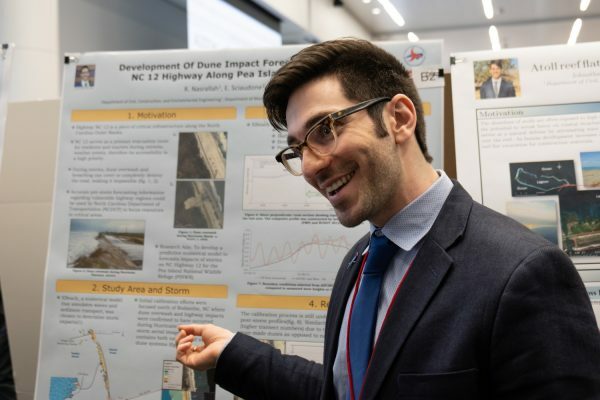 On Friday, March 1st, the Environmental, Water Resources, and Coastal Engineering (EWC) group held their annual Graduate Research Symposium in the Duke Energy Hall at the Hunt Library on Centennial Campus. This was the 19th year for the symposium, which is student-organized. Sixty-five Masters and Ph.D. students, as well as a few undergraduate students, presented their research using colorful posters. For more than two hours, 33 judges from industry and government organizations carefully perused the posters and listened as students spoke about their research findings. Nine finalists were given the opportunity to speak for five minutes apiece to a large audience that included their peers, faculty, visiting prospective graduate students from around the world, the judges, and representatives from the many sponsors who help make the event possible. 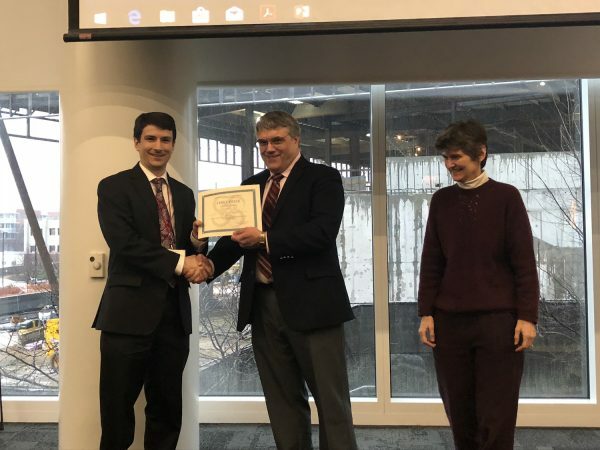 First place went to Joe Hollingsworth, with his presentation entitled “Environmental and economic impacts of solar powered integrated greenhouses.” Hollingsworth is advised by Dr. Joseph DeCarolis. Russell Nasrallah, advised by Dr. Elizabeth Sciaudone, earned second place with “Development of dune impact forecasting system for NC 12 Highway along Pea Island, North Carolina.” Amie McElroy presented “Cometabolism of 1,4dioxane using locally enriched cultures at drinking water relevant concentrations” for the third place win. She is advised by Dr. Detlef Knappe. Other finalists included Yazeed Algurainy, Monica Camacho, Maksim Islam, Megan Jaunich, Sierra Schupp, and Chuhui Zhang. Dr. Chris Frey presents 1st place to Joe Hollingsworth for his presentation entitled “Environmental and economic impacts of solar powered integrated greenhouses.” Keynote speaker Janet G. McCabe on the right. 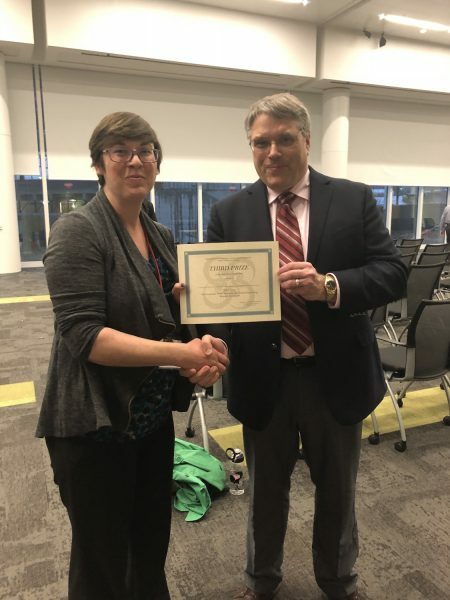 Amie McElroy presented “Cometabolism of 1,4dioxane using locally enriched cultures at drinking water relevant concentrations” for the third place win. For a complete listing of all 65 students who participated as well as information about our sponsors and judges see the program booklet here and view a two minute video here. A highlight of the symposium was keynote speaker Janet G. McCabe, a Professor of Practice at the Indiana University McKenney School of Law, and Assistant Director for Policy and Implementation of IU’s Environmental Resilience Institute. McCabe explored the threats, including the near and long-term implications for public health and public policy, related to the unprecedented deregulatory activity occurring in the current political administration.